Tired of trying to smuggle tampons and pads in purses, pockets, and bags? Sick of always stashing a supply wherever you go during that time of the month? 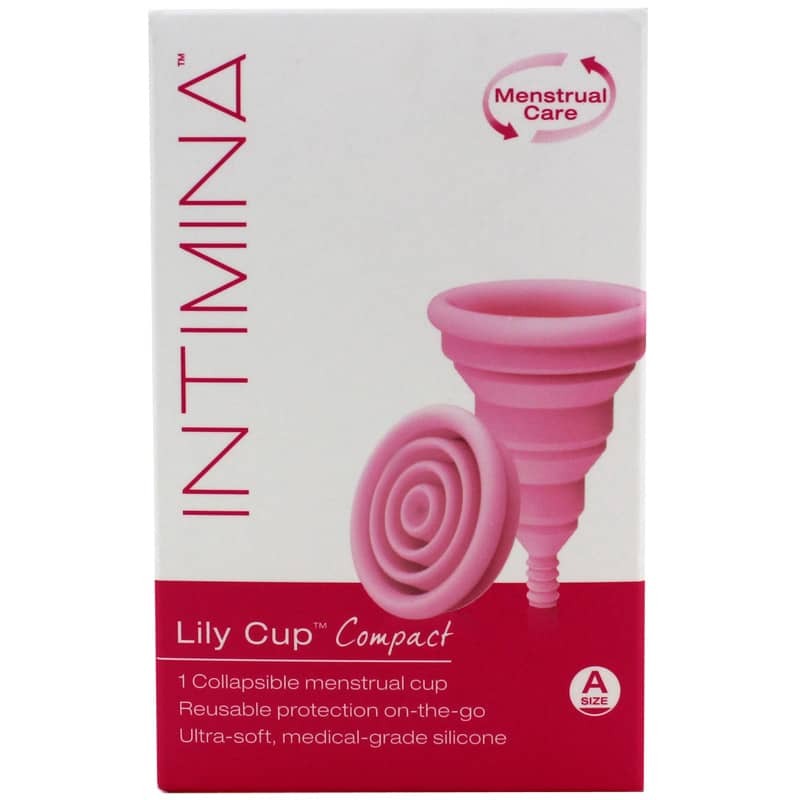 Get compact, discreet, reusable, comfortable Lily Cup Compact Size A by Intimina. Lily Cup Compact is an ultra-soft, reusable collapsible menstrual cup made of professional-grade silicone that's perfect for women on the go. Made of flexible silicone, Lily Cup Compact collapses into a flat circle that can be tucked away just about anywhere. Perfectly shaped to fit your body, Lily Cup Compact collects menstrual flow instead of absorbing it so you experience less bothersome dryness that can come with tampons. Lily Cup Compact Size A is ideal for women who have not given birth or who have given birth by Caesarean. Perfect for light to medium flows, Lily Cup Compact can be worn up to 10 hours at a time. No more extra trips to the bathroom to change pads or tampons. Lily Cup Compact can even be worn all night! 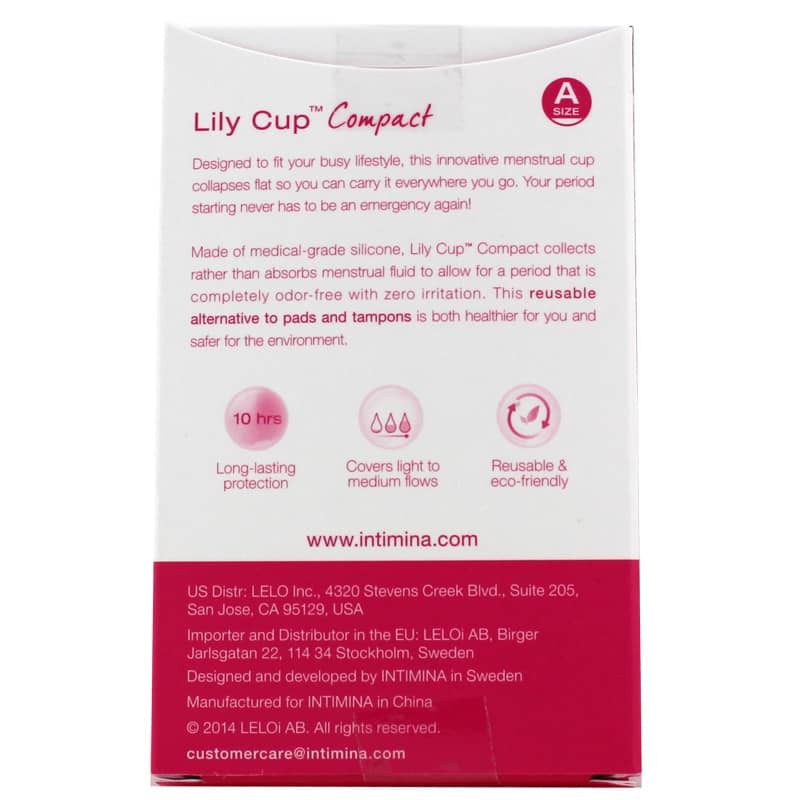 Lily Cup Compact is hypoallergenic and free from fibers and bleaches. And since it helps keep embarrassing odors at bay, you don't have to worry about using anti-odor products with harmful chemicals. Lily Cup is easy to insert and remove. Super-flexible, just fold and insert. When it's time, simply remove, empty, clean, and reinsert. No more waste! Don't let inconvenient tampons and pads interrupt your day. Get Lily Cup Compact. I really liked the idea of having a collapsible cup. It's perfect and discreet to fit in my purse. It was a little difficult to insert because of the softness of the silicone. I did like how comfortable the silicone is, it just made it a little harder to grip and insert. Took a few cycles to get it right, but now I love it and wish I was introduced to this product years ago! Best Cup I've Used Yet! This cup has been the best yet! The silly smooth body of the cup lends itself to easy insertion. The body of the cup does fold up for easy storage, so I was worried this would make it difficult to fully open, but I was wrong. The rim is much firmer than the rest of the cup, so opening is no problem! This cup is also much shorter than the DivaCup, which I also own. Hands down my favorite!